The Kindle Fire was only Amazon’s(s amzn) first foray into the tablet market: Up to six additional tablet models are expected from Amazon, according to various analysts and industry insiders. Reuters offered a summary of the expectations on Monday, which quotes Demos Parneros, the president of office equipment retailer Staples(s spls), saying at least one of the half-dozen Amazon tablets will be a 10-inch model. Rumors of Amazon pushing harder into the mobile device space have cropped up since late last year, following the September introduction of the Kindle Fire tablet. Earlier this month, the company was reportedly testing its own smartphone, likely to be built upon Google’s Android(s goog) operating system, just like the Kindle Fire is. You’d never know that however: Amazon doesn’t use any Google-specific applications on the Fire and hides the Android look-and-feel with an Amazon-branded user interface. So why consider multiple tablet sizes? Amazon has a multitude of shopping and consumption data from laptops and desktops with various screens. It also has information on consumer behavior through its mobile website from iPads(s aapl) and other tablets plus similar data from its Amazon Mobile app and, of course, its own Kindle Fire. And it can use that information to create a range of products that appeal to many, regardless of their personal preference for a small screen, large screen or one sized in between. 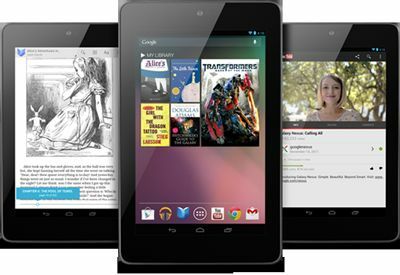 We’ve already seen that a 7-inch slate can be popular and in high demand: Initially with the Fire and more recently, the Google Nexus 7, which Google reportedly underestimated demand. Considering that point, combined with the iPad’s popularity and Amazon’s own data, it shouldn’t surprise anyone if the company outs a 10-inch slate while also improving the 7-inch version with better hardware. But I wouldn’t rule out other screen sizes as well. Just as there’s no one-size fits all for television sets, there isn’t one for the personalized experience a mobile device brings either. You might want to watch Amazon Instant Video title on that 7-inch screen when on the road, for example, but pick up playback on a larger device at home. Amazon is more than willing to sell you both the content and the devices for that experience and it will even keep your place in the movie to make the device switch seamless, no matter what size the screen is. And who pioneered content synchronization? Amazon’s WhisperSync was rightfully touted as a differentiating feature when the first Kindle devices arrived in 2007. The screen size question is one I’ve been interested in for years because I’ve either tested or bought devices in a wide range of sizes. 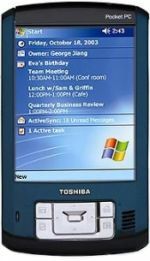 A unique 4-inch VGA personal digital assistant was my “take everywhere” device in 2003, for example, because the screen was massive by comparison to any other pocketable computer at that time. What did I do with that large screen? Most of the same things I do today with my tablets: I read e-books, browsed the web over Wi-Fi, ran mobile apps, and watched videos, although it was much more difficult to do that back then. I had to convert packaged physical media to digital files. Fast forward to today and instead of very few screen size choices for mobile devices, it now seems like we have a size for every hand, pocket and messenger bag. In the past five years alone, we’ve gone from Apple’s groundbreaking 3.5-inch touchscreen to hot selling phones with 5.3-inch displays and tablets as large as 21-inches. Apple again set a standard with its 9.7-inch iPad, but is expected by many to announce a smaller slate, possibly within the next six months. After testing the Kindle Fire and watching it become a holiday sales hit in the last quarter of 2011 — the tablet still shows as no.1 best selling product on Amazon’s website — I’ve long suspected Amazon’s tablet and phone rumors are true. Amazon has watched the shift to mobile activities; both buying items and consuming content are mobile activities. It simply makes sense for the company to expand its line of connected mobile terminals in every form factor consumers are willing to buy. And with a treasure trove of data, Amazon can optimize both the content consumption and online sales experience for tablets and phones, regardless of the screen size consumers choose. For more than 2 years I have been ‘prompting’ the likes of ACER, SAMSUNG et al to make a move into the 6″ screen marketplace. Fundamentally, this is because I believe 6″ to be the ultimate ‘pocketable’ device size. It’s been rather an uphill journey … but now we’ve crested the hill. In the past month it has been noticed that there is a significant ‘rush’ of activity from the Chinese manufacturers in this ‘genre’. This just might be because of the pending announcement of a 5.5 inch Samsung Galaxy NOTE2 product. From some of the leaked pictures it is not infeasible that Samsung may be nurturing a 6 inch announcement. Personally I’m really looking forward to that day ! Amazon is certainly going for the right thing. Six different sizes should meet most peoples criteria better than just one size. Further, Apple just realized the same thing which is why they’re coming out with the smaller tab too. Hi, Kevin – good discussion. In our Tablet Choice study last year, we examined consumers’ preferences for a wide range of features, including screen size, OS and others. We found that about 1 in 6 (17%) prefer 7″ over 10″ models; 1 in 4 (24%) prefer 10″; while about half (53%) like both about equally. As you might expect, preferred screen size is related to anticipated uses (see pp. 13-14 at link below). For findings on preferred tablet sizes, see http://bit.ly/LKbzGu; additional findings (31pp) at http://bit.ly/LKasqp. From the story, all I read is 5-6 SKUs will be launched. If you consider 7″ and 10″ sizes, that is already 2 SKUs. Now add different storage capacities, colors, and/or data connection options and you already can already have a multiple of 5-6. So I wonder if we are really talking various screen sizes, or just different versions of two screen sizes. Kevin, what mean is I don’t believe Amazon or Google are making any money on the hardware tablets, they are hoping to make up the cost on services, but their main competition Apple is better at software and hardware services at this time, strangely Microsoft might have better long term prospects in software and hardware tablets (deeper bank account). Amazon definitely has some strong competition. There are many other industry leaders that are offering tablets of various ranges, each with its own unique pros and cons. I’m not sure if Amazon’s different tablet sizes will give the company the edge it needs, but the visual and physical aspects may be appealing enough to successfully sell. Amazon already has a strong online presence, and it’s taking a risk with producing more versions of their tablets, but I feel that it could all pay off if they strategize and market correctly. All Bezo’s (Amazon) discovered is that they aren’t making any money at 7″ tablets and they will make even less at 10″. Interesting: do you mean Amazon isn’t making money on the Kindle Fire hardware, app store, Amazon storefront, video store, e-book store, music store or all of the above? Amazon is really pulling out all of the stops here, especially when you consider the possible tie-ins with Prime. A growing (and, from certain niche perspectives, really good) streaming catalog and free two-day shipping on a huge number of products and the ability to share these perks with several people in your family for $80 a year. Marry that to an array of mobile devices that are optimized to work within the ecosystem and you’ve got a really compelling package. Kevin, you have a lot of experience with the various Samsung tablet sizes but it seems you keep coming back to the 7″ as the perfect size for keeping a tablet handy as you are out and about while perhaps a 10″ is the size for around the house. While choice is great for the consumer, too many tablet sizes might be confusing. Do you think Amazon is more likely to come out with two tablets, 7″ & 10″, and one phone (maybe 4″ +/-)? The supply chain risk of two many variants might be daunting even for Amazon. Richard, thanks for catching the link issue; I just updated the post to have the correct link. You’re right, I’m a fan of the 7-inch form factor; it goes back to 2008 and my UMPC days, in fact, as those were all 7-inches in size. And I do prefer to carry a small tablet when out and about. I don’t often take 10-inch tablets out of the house. I don’t think several tablet sizes direct from Amazon will confuse. I see several happy people with 8.9-inch tablets for example: For them, 7-inches was too small. Provided that Amazon offers a solid and consistent experience, I think they can get away with multiple sizes. But, that’s just my opinion and you raise a great point with the supply chain challenge.